Here, the leaves are joined together at a central point, radiating like the spokes on a wheel. Hen-and-chicks (Sempervivum) are a classic example. Rosettes may be tiny or they can be quite large. Often the foliage is thick, leathery and succulent. Most rosette-forming alpines are evergreen. Often the central rosette gets larger over time, and forms new babies around itself. Once these are large enough they form roots, and can be carefully separated from the mother plant and moved to a new location. Tuck these into odd little cracks and crevices, almost anywhere! They will take root and grow along the cracks between rocks, then slowly get larger over time. These are terrific in alpine troughs and containers, and you can often cram lots of them in together. They look like little jewels this way. Rosettes provide a wide range of foliage colours and textures, and everybody loves them. Some rosette plants will grow really well in a horizontal position, like in a rock wall. They are easy to stuff into small soil pockets. Some kinds (especially Hen-and-chicks) will even grow on roof tiles or directly on top of a rock. 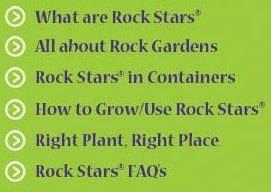 To see different Rock Stars® that form rosettes, try using our Advanced Search to locate them quickly and easily.